It feels weird to be posting a soup recipe when it’s almost April, but it actually snowed in Charlottesville this past weekend so Spring isn’t quite here yet, at least for many of us in the top half of the country. And you know what? That’s kind of okay with me. Spring is beautiful time of year up here, but I actually prefer cold weather. Plus I get to eat more soup! I don’t think there’s anything I love more than soup (well anything that doesn’t have sugar in it, anyway). During the colder months I make soup at least once a week, but I’ve been making it less in the past few months. So last week when the temperature dropped and brought rain and snow with it, I knew I had to make some soup. I figure it’s my last chance before it gets too warm. I recently had some potato soup at Panera Bread and it made me remember how much I love it, so I decided to improvise my own version at home. 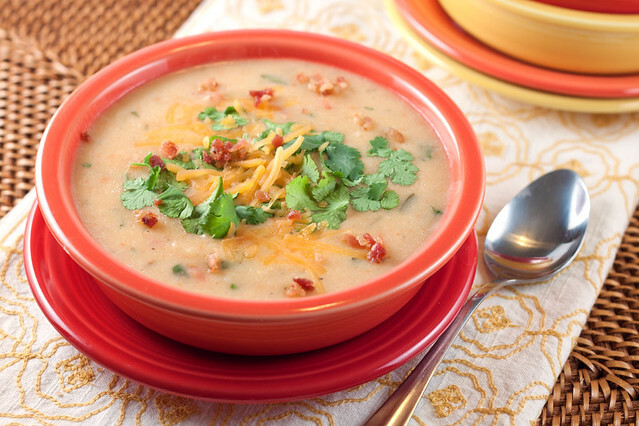 I love spicy soup like my favorite Chicken Tortilla Soup and I love cheesy potato soup, so I figured I would combine those two into a single Tex-Mex inspired potato soup. I looked up other potato soup recipes for reference and many were made with ingredients like cream and eggs. I wanted to keep things lighter since I knew I would be adding cheese and bacon, so I made a very thick base by blending up potatoes, carrots (you can’t taste them, but they make the soup a pretty color!) and chicken broth and then I used non-fat evaporated milk and melted 2% cheese to make it creamy. You would never be able to tell this is a “light” potato soup, though. It’s just as thick and creamy as any of the higher fat versions of it I’ve ever had. The soup is filled with hearty vegetables like onions, garlic, carrots, bell pepper, jalapeno pepper and of course lots of potato. Add to that some bacon, cheese, cilantro and little lime juice for good measure. At first I was worried that all this stuff wouldn’t work well in a potato soup, but in the end I think this the best potato soup I’ve ever eaten! It’s thick and creamy, spicy and cheesy and so very satisfying. *Note: You can either cut up uncooked bacon and cook it with the onions/garlic/peppers or if you want to have extra for sprinkling on top, cook it separately (in a skillet or microwave), crumble it up and add it in with the ground pepper. I noted both instances in the recipe. Place potatoes in a large pot and cover with water. 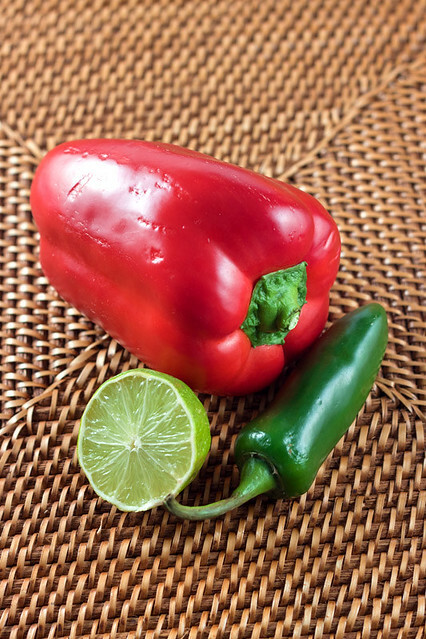 Bring to a boil and cook for 15-20 minutes or until tender. Drain and set aside. While potatoes are cooking, heat oil in a dutch oven or large pot over medium heat and saute onion, garlic and peppers (and uncooked bacon if you want to cook it now) for 5-8 minutes, or until softened. Add in the black and cayenne pepper (and crumbled bacon if you already cooked it separately) and cook for 1 minute longer. Remove from heat and set aside. Heat the soup just to boiling. Add in the cheese and salt. Stir until all the cheese is melted. Stir in cilantro. Serve immediately. Top with extra cheese, cilantro, bacon and a squeeze of lime. *Note: I found this soup to be more than thick enough, but if you like extra thick soup reserve 1/4 cup of the evaporated milk and whisk in the cornstarch until smooth. Add the cornstarch mixture to the pot along with the cheese. Stir regularly and cook until thickened. 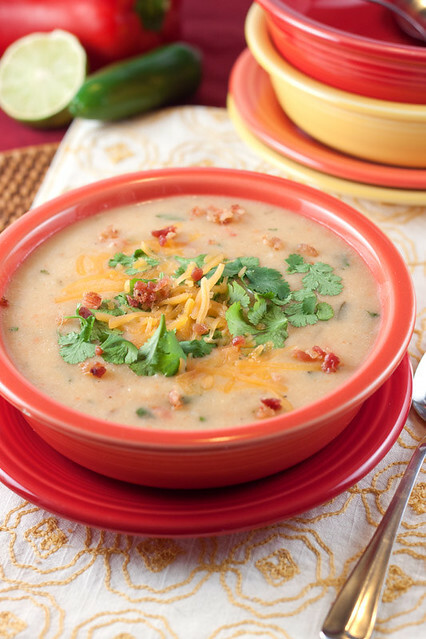 The weather here doesn’t feel much like Spring, so your soup is looking really good right now. This looks super yummy.. actually made my tummy growl 😛 We have some raw spring days ahead of us here in CT, so I think I can sneak some soup in! There seems to be a new trend in the recipe world.